Based on a story by Cedella Marley, in Bob Marley's Three Little Birds growing up can be hard, but "don't worry 'bout a thing, man!" Ziggy wants to get out and enjoy his beautiful island in the sun, but the fear of evil spirits, tropical storms, and bandits keep him locked inside. With the help of a few feathered friends, he learns to face his fears and is reminded in soothing six-part harmony that "every little is thing gonna be alright!" 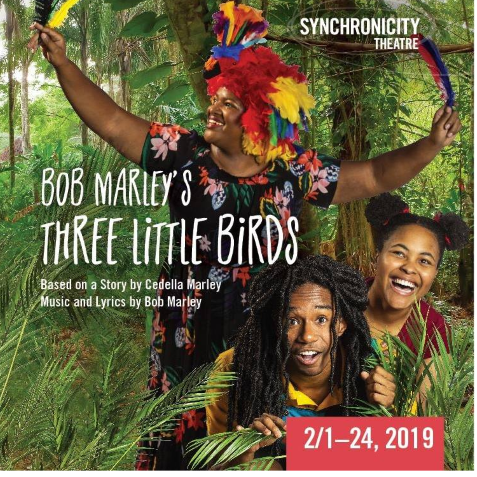 A jammin' musical, featuring the timeless music and lyrics of Bob Marley and based on the children's book by his daughter Cedella, Bob Marley's Three Little Birds shares the legendary artist's message of peace and love with a new generation of songbirds.